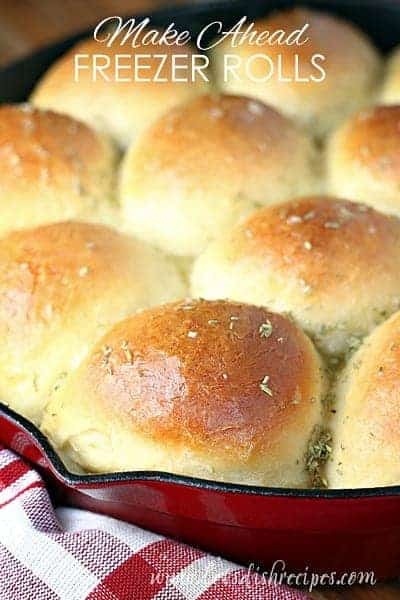 FAVORITE DINNER ROLLS — These soft, buttery dinner rolls are perfect for special occasions and holidays. They freeze well too! 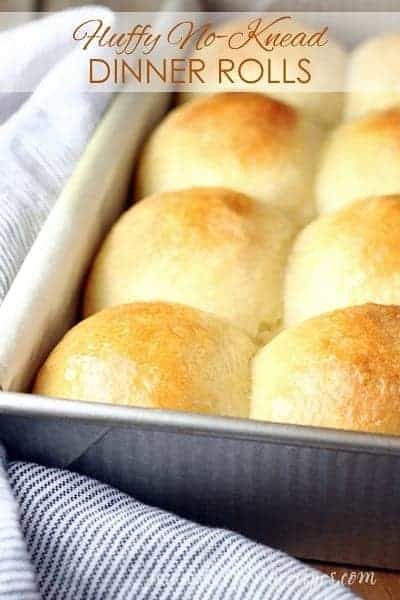 Just in time for your holiday dinner, I’m sharing my family’s Favorite Dinner Rolls recipe (although we have been known to eat them for breakfast, lunch and everything in between). 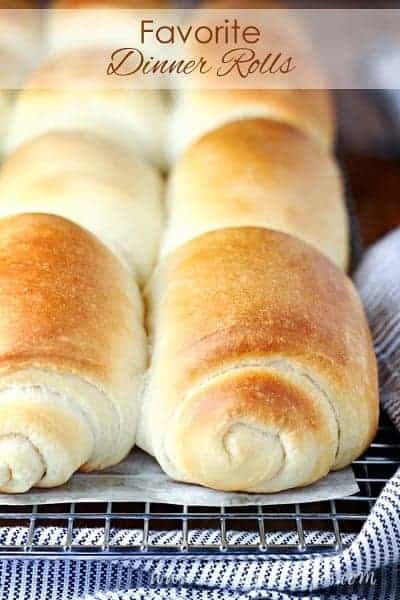 These rolls are so soft and buttery, even a few days after baking–just a few of the reasons they’re one of the few homemade roll recipes I make. Something about the spiral shape of these rolls makes them seem extra special, which is why they usually make an appearance during holidays at my house. Sometimes the rolls can seem like a boring addition to the rest of dinner, but these are dinner rolls that everyone gets excited about! 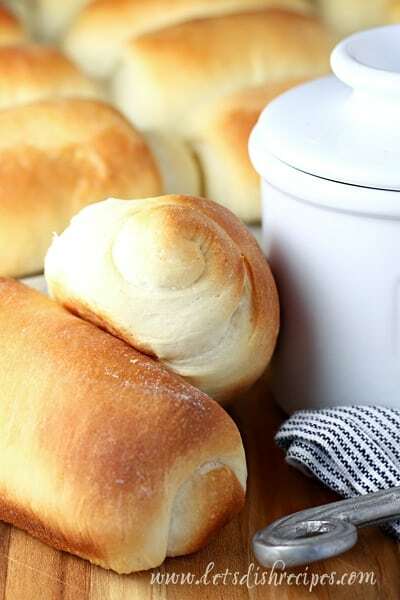 The key to a great texture with these rolls–and most homemade bread–is not adding too much flour to your dough. It takes a bit of practice to figure out when the dough is just right, but this great tutorial on yeast from Mel’s Kitchen Cafe is really helpful. I find it’s always better to stop adding flour when the dough still seems a bit sticky, but can still be shaped and kneaded without too much trouble. Just remember, it’s not going to be as sticky after rising as it was before. 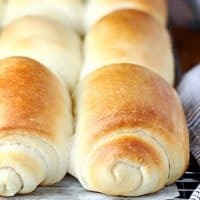 This recipe does make a lot–about two dozen rolls–but they freeze well if you aren’t planning to feed a crowd. My family never has trouble devouring all of them, but I do love the option of making these ahead and putting them in the freezer! 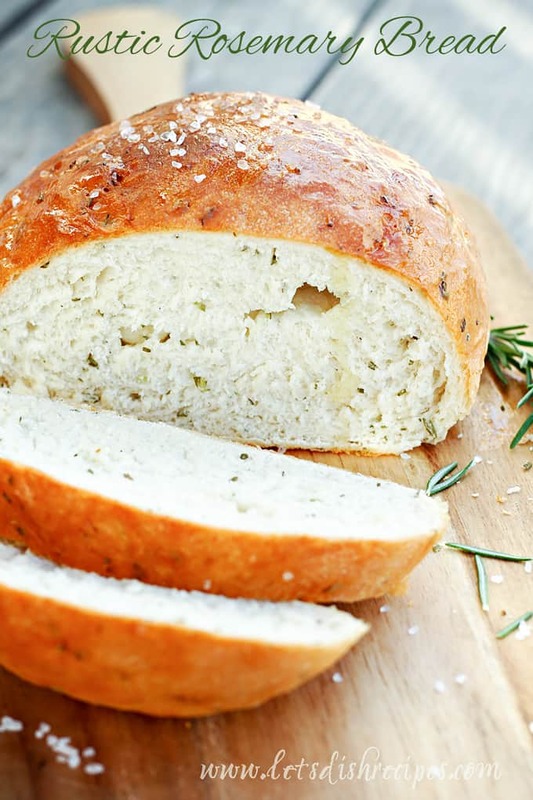 Be sure to save this recipe for Favorite Dinner Rolls to your favorite Pinterest board for later. In a large bowl, combine the yeast, water and sugar. Let stand 5 minutes. Add butter, egg, salt, dry milk, and 2 cups flour and mix well. Add remaining flour gradually (about 1/2 cup at a time) until a soft dough is formed. On a lightly floured surface, knead the dough for 5-7 minutes, or until it is smooth, supple and elastic. Place dough in a large, lightly greased bowl and cover with a clean kitchen towel or greased plastic wrap. Let rise until doubled, about 1 hour. Preheat oven to 375 degrees. Lightly grease a large, rimmed baking sheet. Separate the dough into two portions. Roll each section out to an 12×15 inch rectangle. Brush the top with melted butter. Using a pizza cutter or sharp knife, cut the dough lengthwise into two long rectangles. Slice the dough across into six strips, about 2 inches wide. You should end up with 12 small rectangles. Roll each small rectangle up into a spiral and place on the prepared baking sheet with the roll resting on it’s open edge. Repeat with the second portion of dough. Cover the rolls and let them rise until doubled, about 40 minutes. Bake in the preheated oven for 12-14 minutes or until golden brown. Brush with additional butter, if desired. Who Dished It Up First: Adapted from Mel’s Kitchen Cafe. Be sure to check out her post if you’d like to see more detailed photos of how to form the rolls. Shannon @ Bake. Frost. Repeat. Think I’ll make some of these for my Christmas guests. I can almost smell them baking now! My German Mother-in-law taught me how to bake bread many, many years ago now. I love baking bread. Can’t wait to bake them! Seriously!!! You always take the most gorgeous pictures Danelle. I could stare at this all day – not to mention they look INCREDIBLE! You always wow me.